Madill Golf - Page 69 of 77 - Two Sisters. One Sport. One Passion. Last week’s Ricoh Women’s British Open at Woburn gave the lie to the notion that there’s no interest in women’s golf in this country, with roughly 52,000 spectators tramping the fairways during the championship and many more watching on television on the BBC, where golf is about to become a distant memory. 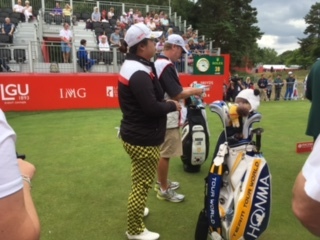 The best women golfers in the world gave a demonstration of ball-striking at its best and the new champion Ariya Jutanugarn was little short of awesome, giving the ball a mighty Thai tonk and holding nothing back. She played with Catriona Matthew in the third round and it was a wonderful contrast in styles, with the Scot, who will be 47 later this month, having to plot her way round the Marquess course in a more canny fashion altogether. Matthew was the leading Briton, sharing 5th place on 279, 9 under par, seven shots behind the winner. Charley Hull, the local heroine, lagged behind her Olympic teammate on 283 but showed glimpses of her best form in a final round of 69. 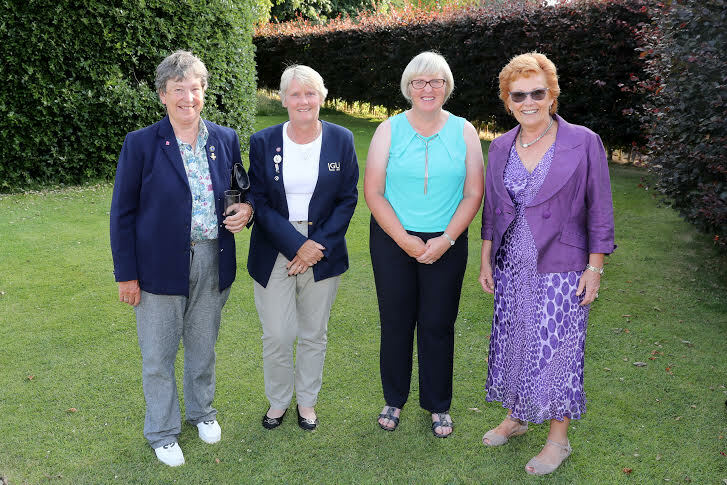 The week before the RWBO Hull was playing for England in the UL International Crown team event in Illinois and had to sit out one of the days because of illness. 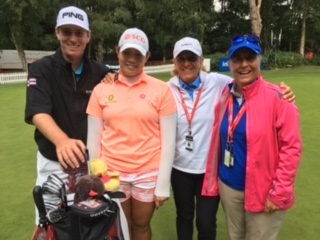 She was then in great demand at Woburn, for tea party photo shoots, interviews, chats with the GB Olympic golf captain Jamie Spence, selfies, what have you and she even experienced first-tee nerves, a rarity for the insouciant 20-year old, as she prepared to perform in front of her family and friends. Rio will provide another challenge and will be nothing like a normal tournament, despite the familiarity of the 72-hole stroke play format. Hull, who suffers from asthma, will have to make sure that her inhaler is properly vetted and all the competitors will have to be extra careful about what they take for any sniffles and snuffles, aches and pains, to ensure they don’t fall foul of the drug testers. There’ll be a lot to take in and the golf will be intense because most of the best women in the world will be there, anxious to secure a medal and make a unique mark in the game. Apologies to Spence, a lovely man despite being an Arsenal supporter, who was kind enough to do a Q & A with madillgolf.com. He even agreed to start again after the klutz operating the iPad realised that she had it in photo mode instead of video. Then halfway through, said klutz noticed that the seconds were no longer ticking up……the machine had had enough, it had run out of capacity and Jamie’s words of wisdom ended up as so much air instead of on air. Sorry captain and the best of luck to team GB (Danny Willett, Justin Rose, Matthew and Hull). May you all be spared from media klutzes and hitches and glitches, technical or otherwise. Good luck also, of course, to team Ireland, captained by Paul McGinley (whose Q & A was conducted by Maureen without a hitch). Padraig Harrington is the leading player, with Seamus Power, Leona Maguire and Stephanie Meadow also in the line-up making golfing history. This will be one of the highlights of their life, let alone their career. 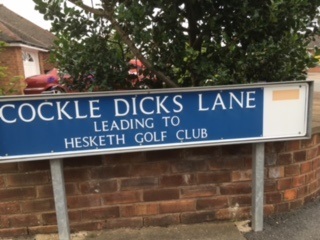 On a less elevated, more prosaic golfing note, the ladies’ captain of Whittington Heath took more than a score of swingers to Southport, England’s Golf Coast, where we played Hesketh – and saw the Hitler Trophy displayed in all its glory (see a previous post for more details) – and Formby Ladies, where they can boast 250 (female) playing members. Wow. Let’s get recruiting girls. 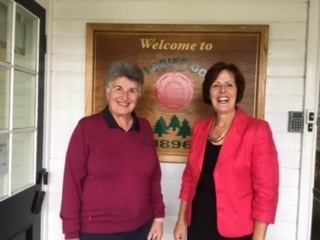 Maureen, as so often, is absolutely right: it is wonderful to be back at Woburn for the Ricoh Women’s British Open, for the 40th anniversary of a championship that has had a chequered history but is now indubitably a major championship. Also considerably younger but venerable enough were the first three winners of the championship, who had been invited to the celebrations this week: Jenny Lee Smith, Vivien Saunders and Janet Melville, three Englishwomen who deserve to be feted alongside the Karrie Webbs and Se Ri Paks of this world, not least for their pioneering spirit. In 1984, Ayako Okamoto, revered in Japan, won the first British at Woburn by a mind-numbing 11 shots and it’s worth listing the other Woburn winners, some of them good players having their week of weeks, some of them very, very goods and some of them genuine greats: Helen Alfredsson, Penny Grice-Whittaker, Patty Sheehan, Karen Lunn, Liselotte Neumann, Webb, Emilee Klein and Sherri Steinhauer. There are golfing ghosts and magical memories everywhere at Woburn, which played host to the British for seven successive seasons during the Weetabix era. Sir Richard George, who took over the family business and was knighted for services to the cereal industry, was also a serial golfer and when he died earlier this year, women’s golf lost one of its staunchest supporters. It’s hard not to think of him here this week, wooing the Americans in search of major status and perhaps crossing egos with Franck Riboud of Evian, whose empire was on a vaster scale altogether. Whatever their differences, they were both shrewd businessmen who loved golf and women, for which many thanks. Woburn was also home to the Ford Ladies Classic, the tournament that used to open the season in Britain and became so popular that there were traffic jams on the M1 as people queued to get in and the car parks overflowed. Not many women’s events ever took top billing on the national travel news! Annika Sorenstam started her professional travels here, with her Dad Tom on the bag. It was here that Laura Davies, in her considerable pomp, took a raggle-taggle of spectators yomping in her wake as she gave the ball a whack, not always in the recommended direction, found it and whacked it again. After one thrilling expedition through the trees to the wrong fairway, Laura somehow avoided the forest with her next whack, carried a yawning dip and landed the ball at the front edge of the correct green. Well worth the detour. LD, like Seve, always did see things differently. It was here, in 1995, that Webb, the sweet-swinging Australian from Ayr, in the sugar cane country of Queensland, won the first of her three British titles and served notice that hers was an exceptional – and enduring – talent. She’s playing again this week, at the age of 41, wondering where those 20-odd years have gone. Other former British champions are also all around in one capacity or another: Sweden’s Alfredsson and Kent’s Karen Stupples are broadcasting; Marta Figueras-Dotti, the Spaniard who won the title as an amateur at Birkdale in 1992, is multi-tasking as coach, photographer and Olympic captain; Sophie Gustafson is caddying for Beth Allen; and Mo Martin, Stacy Lewis, Jiyai Shin, Yani Tseng and Catriona Matthew are still playing. There’s still a warm, welcoming feel to Woburn even though its airport lounge of an entrance with the automatic doors lacks charm and the club and the championship are slicker, less homely than they once were. There’s been an ongoing process of professionalisation. It was as long ago as 1993 but seems like only yesterday that Bob Imrie, caddying for his daughter Kathryn, caused the unceremonious banning of trolleys from the championship. She was in contention, in the biggest championship in the country, on live prime-time television and the man in charge of operations was incandescent when he saw the trolley squeaking its way across the screen. It smacked of rank amateurism in a professional setting and from that day on trolleys were toast. Caddies, Dads or not, had to carry.